For the American basketball player born Ron Artest who changed his name to the term, see Metta World Peace. Mettā (Pali) or maitrī (Sanskrit) means benevolence, loving-kindness, friendliness, amity, friendship, good will, kindness, and active interest in others. It is the first of the four sublime states (Brahmavihāras) and one of the ten pāramīs of the Theravāda school of Buddhism. The cultivation of benevolence (mettā bhāvanā) is a popular form of meditation in Buddhism in the Theravadin Buddhist tradition. In the Tibetan Buddhist tradition, it is part of the Brahmavihara meditation (four immeasurables). Metta as 'compassion meditation' is often practiced in Asia by broadcast chanting, wherein monks chant for the laity. The compassion and universal loving-kindness concept of Metta is discussed in the Metta Sutta of Buddhism, and is also found in the ancient and medieval texts of Hinduism and Jainism as Metta or Maitri. Small sample studies on the potential of loving-kindness meditation approach on patients suggest potential benefits. However, peer reviews question the quality and sample size of these studies, then suggest caution. Mettā is a Pali word, from maitrī itself derived from mitra which, states Monier-Williams, means "friendly, amicable, benevolent, affectionate, kind, good-will", as well as a form of "love, amity, sympathy". The term is found in this sense in the Vedic literature, such as the Shatapatha Brahmana and various early Upanishads, and Vedanga literature such as Pāṇini's Aṣṭādhyāyī 5.4.36. The term appears in Buddhist texts as an important concept and practice. Buswell and Lopez, as well as Harvey, translate metta as "loving-kindness". In Buddhist belief, this is a Brahma-vihara (divine abode) or an immeasurable that leads to a meditative state by being a counter to ill-will. It removes clinging to negative state of mind, by cultivating kindness unto all beings. Mettā meditation, or often loving-kindness meditation, is the practice concerned with the cultivation of Mettā, i.e. benevolence, kindness and amity. The practice generally consists of silent repetitions of phrases like “may you be happy” or “may you be free from suffering”, for example directed at a person who, depending on tradition, may or may not be internally visualized. Two different methodological approaches have been discerned in recent review papers, practices that focus on compassion and practices focussing on loving-kindness. Focussing on compassion means that meditation consists of the wish to relieve a being from suffering, whereas focussing on loving-kindness means wishing a being happiness. Prior to the advent of the Buddha, according to Martin Wiltshire, there existed the traditions of Brahma-loka and meditation with the four virtues of loving-kindness, compassion, empathetic joy and equanimity. The early Buddhist texts assert that pre-Buddha ancient Indian sages who taught these virtues were earlier incarnations of the Buddha. Post-Buddha, these same virtues are found in the Hindu texts such as verse 1.33 of the Yoga Sutras of Patañjali, wherein the word Maitri is synonymous with Metta. Loving-kindness (maitri), along with compassion and equanimity, are found in the early Upanishads of Hinduism, while loving-kindness (metta) is found in early Sutras of Jainism along with compassion, empathetic joy and equanimity. The ancient Indian Paccekabuddhas mentioned in the early Buddhist Suttas, those who lived before the Buddha, mention all "four immeasurables" and Brahmavihara, and they are claimed in the Suttas to be previous incarnations of the Buddha. According to Peter Harvey, the Buddhist scriptures acknowledge that the Metta-concept containing four Brahmavihara meditation practices "did not originate within the Buddhist tradition". The Buddha never claimed that the "four immeasurables" and related Metta-meditation were his unique ideas, states Harvey Aronson, in a manner similar to "cessation, quieting, nirvana". The pre-Buddha Chandogya Upanishad, states Jayatilleke, in section 8.15 teaches metta and ahimsa to all creatures claiming that this practice leads to Brahmaloka. The shift in Vedic ideas, from rituals to virtues, is particularly discernible in the early Upanishadic thought, and it is unclear as to what extent and how early Upanishadic traditions of Hinduism and Sramanic traditions such as Buddhism and Jainism influenced each other, on ideas such as "four immeasurables", meditation and Brahmavihara. Benevolence towards all living beings, joy at the sight of the virtuous, compassion and sympathy for the afflicted, and tolerance towards the insolent and ill-behaved. In the Pāli Canon, the term metta appears in many texts such as the Kakacupama Sutta and Karaniya Metta Sutta. Other canonical materials, such as in the Paṭisambhidāmagga, elaborate on it as a practice. Other canonical sources, such as the Abhidhamma, underline the key role of benevolence in the development of wholesome karma for better rebirths. May all beings be happy and secure, may they be happy-minded! may all being, without exception be happy-minded. in anger or ill-will let them not wish any suffering to each other. even so, let him cultivate a boundless heart towards all beings. above, below and across, without obstruction, without any hatred, without any enmity. This they say is divine abiding here. He will surely not come again to any womb (rebirth in the sense-desire realm). Metta or lovingkindness here, states Harvey, is a heartfelt aspiration for the happiness of all beings. It is different than "lack of ill-will", and more an antidote to it, fear and hatred. It is the precept to conquer anger by kindness, conquer the liar by truth, conquer stingy by giving, conquer evil by good, stater Harvey. "What ... is the path to the company of Brahmā? Here a bhikkhu abides pervading one quarter with a mind imbued with benevolence, likewise the second, likewise the third, likewise the fourth; so above, below, around, and everywhere, and to all as to himself, he abides pervading the all-encompassing world with a mind imbued with benevolence, abundant, exalted, immeasurable, without hostility, and without ill will. When the deliverance of mind by benevolence is developed in this way, no limiting action remains there, none persists there. "Just as a vigorous trumpeter could make himself (or herself) heard without difficulty in the four quarters, so too, when the deliverance of mind by benevolence is developed in this way, no limiting action remains there, none persists there. This is the path to the company of Brahmā." ten ways of "directional pervasion" (disā-pharaṇā), of the eastern direction (puratthimāya disāya), of the western direction (pacchimāya disāya), of the northern direction (uttarā disāya), of the southern direction (dakkhīṇāya disāya), of the eastern intermediate direction (puratthimāya anudisāya), of the western intermediate direction (pacchimāya anudisāya), of the northern intermediate direction (uttarā anudisāya), # of the southern intermediate direction (dakkhīṇāya anudisāya), of the downward direction (heṭṭhimāya disāya), of the upward direction (uparimāya disāya). Moreover, the directional pervasions can then be applied to each of the unspecific and specific pervasions. For instance, after radiating benevolence to all beings in the east (Sabbe puratthimāya disāya sattā ...), one radiates it to all beings in the west and then north and then south, etc. ; then, one radiates it to all breathing things in this fashion (Sabbe puratthimāya disāya pāṇā ...), then all creatures, persons, and so forth until such is extended for all those born in the lower realms. One sleeps easily, wakes easily, dreams no evil dreams. One is dear to human beings, dear to non-human beings. The devas protect one. Neither fire, poison, nor weapons can touch one. One's mind gains concentration quickly. One's complexion is bright. One dies unconfused and – if penetrating no higher – is headed for [reborn in] the Brahma worlds. Monks, whatever grounds there are for making merit productive of a future birth, all these do not equal a sixteenth part of the liberation of mind by benevolence. The liberation of mind by benevolence surpasses them and shines forth, bright and brilliant. Mettā meditation is regularly recommended to the Buddha's followers in the Pali canon. The canon generally advises radiating metta in each of the six directions, to whatever beings there may be. A different set of practical instructions, still widely used today, is found in the 5th CE Visuddhimagga. In addition, variations on this traditional practice have been popularized by modern teachers and applied in modern research settings. Metta is found in pre-Buddhist Vedic Sanskrit texts as Maitrī, Maitra and Mitra, which are derived from the ancient root Mid (love), and these Vedic words appear in the Samhita, Aranyaka, Brahmana and Upanishad layers of texts in the Rigveda, Samaveda, Yajurveda and Atharvaveda. He hath enjoyed my lovingkindness, the all-knower. Similarly, the term appears in hymn 55 of Book 19 of the Atharvaveda, and various Upanishads. A major early Upanishad of Hinduism, named Maitri Upanishad, discusses universal kindness and amity. The Maitri Upanishad, states Martin Wiltshire, provides the philosophical underpining, by asserting, "what a man thinks, that he becomes, this is the eternal mystery". This idea, adds Wiltshire, reflects the assumption in the ancient thought that man influences his own environment and situation, causality is equitable, and "good volitional acts conduce pleasant situations, while bad volitional acts conduce unpleasant situations". The Maitri Upanishad teaches, states Juan Mascaró, that peace begins in one's own mind, in ones longing for truth, in looking within, and that "a quietness of mind overcomes good and evil works, and in quietness the soul is one: then one feels the joy of eternity." The Isha Upanishad similarly discusses universal amity and loving-kindness, but without the term metta. These teachings of universal Maitri influenced Mahatma Gandhi. In Jainism, Yogabindu – the 6th-century yoga text by Haribhadra – uses the Sanskrit word Maitri in verses 402-404, in the sense of loving-kindness towards all living beings. Some pilot research studies on the effect of Mettā meditation indicate an increase in positive emotions for practitioners. In particular, an immediate impact on positive emotions after practice as well as a long term effect could be shown, though these effects might not hold true for everybody. In one proof-of-concept study, uncontrolled in sample selection and benchmarking, the researchers report therapeutic potential for psychological problems like depression or social anxiety, when combined with other reliable treatments. The application of Mettā meditation for the treatment of psychological and other healthcare related problems is topic of current research. Hofmann et al. discuss in their paper the potential use for therapy and report insufficient data, with some promising studies so far. Those studies could show a positive impact on problems such as schizophrenia, depression and anxiety. According to Hofmann et al., there needs to be more rigorous research, especially with the application of Buddhist approaches to loving-kindness and compassion meditation. In an 8-week pilot study in 2005, loving-kindness meditation showed reduced pain and anger in people with chronic lower back pain. Compassion meditation, a Science Daily article states, may benefit by reductions in inflammatory and behavioral responses to stress that have been linked to depression and a number of medical illnesses. Bishop in a 2002 review suggests caution on claims of benefits, and states, "what has been published has been rife with methodological problems. At present, we know very little about the effectiveness of this [mindfulness-lovingkindness-compassion meditation] approach; however, there is some evidence that suggests that it may hold some promise." In a 2014 review of multiple studies, Galante et al. reach a similar conclusion, stating "results were inconclusive for some outcomes, in particular against active controls; the methodological quality of the reports was low to moderate; results suffered from imprecision due to wide CIs deriving from small studies" and that "the kindness meditation methods show evidence of individual and community benefits through its effects on their well-being and social interaction". ↑ Gethin (1998), pp. 26, 30, passim [spelled as two words: "loving kindness"]; Harvey (2007), pp. 247-8 [spelled without a hyphen: "lovingkindness"]; Ñāṇamoli & Bodhi (2001), pp. 120, 374, 474, passim; Salzberg (1995), passim [without a hyphen]; Walshe (1995), p. 194. 1 2 Warder (2004), pp. 63, 94. 1 2 3 4 Rhys Davids & Stede (1921-25), p. 540, entry for "Mettā," retrieved 2008-04-29 from "U. Chicago" at http://dsal.uchicago.edu/cgi-bin/philologic/getobject.pl?c.3:1:177.pali. 1 2 3 4 Monier Williams, 1964, p. 834, entry for "Maitrī," retrieved 2008-04-29 from "U. Cologne" at http://www.sanskrit-lexicon.uni-koeln.de/cgi-bin/serveimg.pl?file=/scans/MWScan/MWScanjpg/mw0834-meSUraNa.jpg. ↑ Richard Gombrich (1988, reprinted 2002), Theravada Buddhism: A Social History from Ancient Benares to Modern Colombo. Routledge: London. ISBN 0-415-07585-8. ↑ Peter Harvey (2012). An Introduction to Buddhism: Teachings, History and Practices. Cambridge University Press. pp. 318–319. ISBN 978-0-521-85942-4. ↑ Finley P. Dunne (2013). The World Religions Speak on "The Relevance of Religion in the Modern World". Springer. pp. 94–95. ISBN 978-94-017-5892-5. 1 2 3 4 5 6 Zeng, Xianglong; Chiu, Cleo P. K.; Wang, Rong; Oei, Tian P. S.; Leung, Freedom Y. K. (2015-01-01). "The effect of loving-kindness meditation on positive emotions: a meta-analytic review". Psychology for Clinical Settings: 1693. doi:10.3389/fpsyg.2015.01693. PMC 4630307 . PMID 26579061. 1 2 3 4 5 Hofmann, Stefan G.; Petrocchi, Nicola; Steinberg, James; Lin, Muyu; Arimitsu, Kohki; Kind, Shelley; Mendes, Adriana; Stangier, Ulrich (2015-06-02). "Loving-Kindness Meditation to Target Affect in Mood Disorders: A Proof-of-Concept Study". Evidence-Based Complementary and Alternative Medicine. 2015: 1–11. doi:10.1155/2015/269126. ISSN 1741-427X. PMC 4468348 . PMID 26136807. 1 2 Galante, Julieta; Galante, Ignacio; Bekkers, Marie-Jet; Gallacher, John (2014). "Effect of kindness-based meditation on health and well-being: A systematic review and meta-analysis.". Journal of Consulting and Clinical Psychology. 82 (6): 1101–1114. doi:10.1037/a0037249. ISSN 1939-2117. 1 2 Bishop SR (2002). "What do we really know about mindfulness-based stress reduction?". Psychosom Med. 64 (1): 71–83. doi:10.1097/00006842-200201000-00010. PMID 11818588. 1 2 3 4 Thomas William Rhys Davids; William Stede (1921). Pali-English Dictionary. Motilal Banarsidass. p. 540. ISBN 978-81-208-1144-7. ↑ Robert E. Buswell Jr.; Donald S. Lopez Jr. (2013). The Princeton Dictionary of Buddhism. Princeton University Press. p. 624. ISBN 978-1-4008-4805-8. 1 2 Peter Harvey (2012). An Introduction to Buddhism: Teachings, History and Practices. Cambridge University Press. p. 327. ISBN 978-0-521-85942-4. 1 2 3 4 Martin G. Wiltshire (1990). Ascetic Figures Before and in Early Buddhism: The Emergence of Gautama as the Buddha. Walter de Gruyter. pp. 248–264. ISBN 978-3-11-009896-9. ↑ Martin G. Wiltshire (1990). Ascetic Figures Before and in Early Buddhism: The Emergence of Gautama as the Buddha. Walter de Gruyter. pp. 241–242. ISBN 978-3-11-009896-9. ↑ K N Jayatilleke (2013). Early Buddhist Theory of Knowledge. Routledge. pp. 477–479. ISBN 978-1-134-54287-1. ↑ In addition to AN 10.176, other discourses that contain this text include: Discourse for the Brahmans of Sala (Sāleyyaka Sutta, MN 41) (Ñanamoli & Khantipalo, 1993); Discourse for the Brahmins of Verañja (Verañjaka Sutta, MN 42, which is substantially a reiteration of MN 41 in a different locale); Sutta on the To Be Cultivated and Not to Be Cultivated (Sevitabbāsevitabba Sutta, MN 114) (Ñāṇamoli & Bodhi, 2001, p. 917); First Discourse on Hell and Heaven (Paṭhama-niraya-sagga Sutta, AN 10.211); Second Discourse on Hell and Heaven (Dutiya-niraya-sagga Sutta, AN 10.212); First Discourse on Intentional Actions (Paṭhama-sañcetanika Sutta, AN 10.217); Second Discourse on Intentional Actions (Dutiya-sañcetanika Sutta, AN 10.218); as well as in the Paṭisambhidāmagga (see below) and the paracanonical Milinda Pañha. 1 2 Peter Harvey (2012). An Introduction to Buddhism: Teachings, History and Practices. Cambridge University Press. p. 279. ISBN 978-0-521-85942-4. ↑ See for instance, in the Digha Nikāya alone, The Great Splendor Discourse (Mahāsudassana Sutta, DN 17), v. 2.4 (Walshe, 1995, p. 287); The Great Steward Discourse (Mahāgovinda Sutta, DN 19), v. 59 (Walshe, 1995, p. 312); The Great Lion's Roar to the Udumbarikans Discourse (Udumbarika-Sīhanāda Sutta, DN 19), v. 17 (Walshe, 1995, pp. 390-391); and The Lion's Roar on the Turning of the Wheel Discourse (Cakkavatti-Sīhanāda Sutta, DN 79), v. 28 (Walshe, 1995, p. 405). ↑ This particular English text is from the Nyanaponika (1988) translation of the Simile of the Cloth (Vatthūpama Sutta, MN 7), v. 12. ↑ Bodhgaya News(n.d.), Majjhima Nikaya, book 1, BJT p. 88, retrieved 2009-08-07 at http://www.bodhgayanews.net/tipitaka.php?title=&record=2987. ↑ See, for instance, the Discourse to Subha (Subha Sutta, MN 99) (Ñāṇamoli & Bodhi, 2001, pp. 816-17); and, The Threefold Knowledge Discourse (Tevijja Sutta, DN 13), vv. 76-77 (Walshe, 1995, p. 194). See also the Discourse to Dhānañjāni (Dhānañjāni Sutta, MN 97) (Ñāṇamoli & Bodhi, 2001, p. 796), in which a similar statement about union with Brahma is made by the Ven. Sariputta without the trumpeter metaphor. ↑ MN 99 (Ñāṇamoli & Bodhi, 2001, pp. 816-17). In this translation, this text is presented as one paragraph. Here, it was divided into two, thus following the Pāli text presentation, to enhance readability. 'Katamo ca ..., brahmānaṃ sahavyatāya maggo: idha ..., bhikkhu mettāsahagatena cetasā ekaṃ disaṃ pharitvā viharati. Tathā dutiyaṃ, tathā tatiyaṃ, tathā catutthiṃ. Iti uddhamadho tiriyaṃ sabbadhi sabbattatāya sabbāvantaṃ lokaṃ mettā sahagatena cetasā vipulena mahaggatena appamāṇena averena abyāpajjhena pharitvā viharati. Evaṃ bhāvitāya kho ..., mettāya cetovimuttiyā yaṃ pamāṇakataṃ kammaṃ, na taṃ tatrāvasissati. Na taṃ tatrāvatiṭṭhati. ↑ Cited in Buddhaghosa & Ñāṇamoli (1999), p. 302, Vsm.IX,50. See also Ñanamoli (1987), section 11, "Methodical Practice: from the Patisambhidamagga," where this sentence is translated as: "May all beings be freed from enmity, distress and anxiety, and may they guide themselves to bliss." ↑ In this section of this article, the primary English-language sources are Buddhaghosa & Ñāṇamoli (1999), pp. 301-304, Vsm.IX,49-58; and, Ñanamoli (1987), section 11, "Methodical Practice: from the Patisambhidamagga." The Pali is primarily based on Bodhgaya News (n.d.), Patisambhidamagga 2, BJT pp. 64-80, retrieved 2009-08-07 starting at http://www.bodhgayanews.net/tipitaka.php?title=&record=9611. ↑ AN 11.16 (trans. Thanissaro, 1997b). See also AN 8.1 (similarly entitled, Mettānisaṃsa Sutta [SLTP] and Mettā Suttaṃ [CSCD]) which omits the last three of four benefits mentioned in AN 11.16 (that is, it omits "One's mind gains concentration quickly. One's complexion is bright. One dies unconfused..."). ↑ AN 1.ii.7 (trans. Nyanaponika & Bodhi, 1999, p. 34). ↑ See, e.g. MN 7.12, Snp 1.8/Khp 9: , . ↑ Ralph Griffith (1896). The Hymns of the Atharvaveda. E. J. Lazarus. pp. 312–313. ↑ S. Radhakrishnan (1992). Rabindranath Tagore: A Centenary. Sahitya Akademi. p. 387. ISBN 978-81-7201-332-5. ↑ Martin G. Wiltshire (1990). Ascetic Figures before and in Early Buddhism: The Emergence of Gautama as the Buddha. Walter de Gruyter. pp. 94–95. ISBN 978-3-11-085856-3. ↑ Juan Mascaró (1965). The Upanishads. Penguin. pp. 103–104. ISBN 978-0-14-044163-5. ↑ Kalyan Sen Gupta (2016). The Philosophy of Rabindranath Tagore. Routledge. p. 10. ISBN 978-1-317-02143-8. ↑ Nancy Snow (2012). Deen K. Chatterjee, ed. Encyclopedia of Global Justice. Springer Science & Business Media. p. 2155. ISBN 978-1-4020-9160-5. ↑ Christopher Key Chapple (2015). Yoga in Jainism. Routledge. p. 175. ISBN 978-1-317-57217-6. ↑ Carson, J. W. (2005). "Loving-Kindness Meditation for Chronic Low Back Pain: Results From a Pilot Trial". Journal of Holistic Nursing. SAGE. 23 (3): 287–304. doi:10.1177/0898010105277651. ↑ "Compassion Meditation May Improve Physical And Emotional Responses To Psychological Stress". ScienceDaily. 2008. Retrieved 2016-06-07. Acharya Buddharakkhita (trans.) (1987/2006). "Kakacupama Sutta: The Parable of the Saw (excerpt)" from Positive Response: How to Meet Evil With Good (Bodhi Leaves No. 109). Kandy, Sri Lanka: Buddhist Publication Society (1987). Retrieved from "Access to Insight" (2006) at http://www.accesstoinsight.org/tipitaka/mn/mn.021x.budd.html. Amaravati Sangha (trans.) (1994, 2004). "Karaniya Metta Sutta: The Buddha's Words on Loving-Kindness" from Chanting Book: Morning and Evening Puja and Reflections (1994). Hemel Hempstead: Amaravati Publications. Retrieved 2007-11-25 from "Access to Insight" (2004) at http://www.accesstoinsight.org/tipitaka/kn/snp/snp.1.08.amar.html. Bodhi, Bhikkhu (2005). In the Buddha's Words: An Anthology of Discourses from the Pali Canon. Somerville, MA: Wisdom Publications. ISBN 0-86171-491-1. Gombrich, Richard (1988; reprinted 2002). Theravada Buddhism: A Social History from Ancient Benares to Modern Colombo. Routledge: London. ISBN 0-415-07585-8. Monier-Williams, Monier (1899, 1964). A Sanskrit-English Dictionary. London: Oxford University Press. ISBN 0-19-864308-X. Retrieved 2008-04-29 from "Cologne University" at http://www.sanskrit-lexicon.uni-koeln.de/scans/MWScan/index.php?sfx=pdf. Ñanamoli Thera (ed., trans.) (1987/1994). The Practice of Loving-Kindness (Metta): As Taught by the Buddha in the Pali Canon (The Wheel No. 7). Kandy, Sri Lanka: Buddhist Publication Society (1987). Retrieved 2007-11-25 from "Access to Insight" (1994 transcription) at http://www.accesstoinsight.org/lib/authors/nanamoli/wheel007.html. Ñāṇamoli, Bhikkhu (trans.) & Bhikkhu Bodhi (ed.) (2001). The Middle-Length Discourses of the Buddha: A Translation of the Majjhima Nikāya. Boston: Wisdom Publications. ISBN 0-86171-072-X. Ñanamoli Thera (trans.) & Bhikkhu Khantipalo (ed.) (1993/1994). Saleyyaka Sutta: The Brahmans of Sala (MN 41). Retrieved 2007-12-23 from "Access to Insight" (1994 transcription) at http://www.accesstoinsight.org/tipitaka/mn/mn.041.nymo.html. Nyanaponika Thera (trans.) (1988/1998). 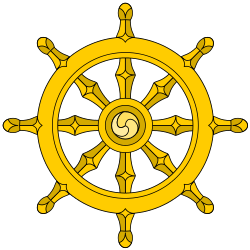 "Vatthupama Sutta: The Simile of the Cloth" (MN 7) from The Simile of the Cloth & the Discourse on Effacement (Wheel No. 61). Kandy, Sri Lanka: Buddhist Publication Society (1988). Retrieved 2007-12-03 from "Access to Insight" (1998) at http://www.accesstoinsight.org/tipitaka/mn/mn.007.nypo.html. Nyanaponika Thera & Bhikkhu Bodhi (trans.) (1999). Numerical Discourses of the Buddha: An anthology of Suttas from the Aṅguttara Nikāya. Walnut Creek, CA: AltaMira Press. ISBN 0-7425-0405-0. Rhys Davids, T.W. & William Stede (eds.) (1921-5). The Pali Text Society’s Pali–English Dictionary. Chipstead: Pali Text Society. Retrieved 2008-04-29 from "U. Chicago" at http://dsal.uchicago.edu/dictionaries/pali/. Thanissaro Bhikkhu (trans.) (1994). Raja Sutta: The King (Ud. 5.1). Retrieved 2007-11-25 from "Access to Insight" at http://www.accesstoinsight.org/tipitaka/kn/ud/ud.5.01.than.html. Thanissaro Bhikkhu (trans.) (1997a). Cunda Kammaraputta Sutta: To Cunda the Silversmith (AN 10.176). Retrieved 2007-11-25 from "Access to Insight" at http://www.accesstoinsight.org/tipitaka/an/an10/an10.176.than.html. Thanissaro Bhikkhu (trans.) (1997b). Metta (Mettanisamsa) Sutta: Good Will (AN 11.16). Retrieved 2010-07-07 from "Access to Insight" at http://www.accesstoinsight.org/tipitaka/an/an11/an11.016.than.html. Trungpa, Chögyam (1993). Training the Mind & Cultivating Loving-Kindness. Boston: Shambhala. ISBN 0-87773-954-4. Upatissa, Arahant, N.R.M. Ehara (trans. ), Soma Thera (trans.) and Kheminda Thera (trans.) (1995). The Path of Freedom (Vimuttimagga). Kandy, Sri Lanka: Buddhist Publication Society. ISBN 955-24-0054-6.